On 21 to 23 November OSD will be exhibiting at AusRail PLUS 2017 at the Brisbane Convention & Exhibition Centre. Please visit us at stand 200 where we will be demonstrating OSD’s new Optical Data Link Module (ODLM), Industrial Ethernet and Serial Data Redundant Ring solutions plus a broad range of railway signalling protective devices, test products and remote monitoring/detection systems from Park Signalling. Please see http://www.ausrail.com/ to register or for more information. Thanks to all who attended OSD’s stand at Security 2017 in Sydney. It was great to have the exhibition in OSD’s hometown of Sydney however we will be off to Melbourne for next years event. 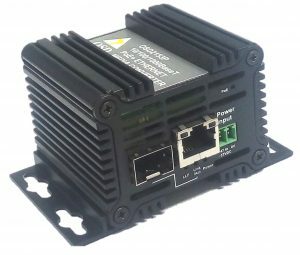 The OSD2153P is an Industrial PoE++ Gigabit Ethernet Media Converter which supports up to 60W PoE and can operate at 100Mbps or 1000Mbps over fiber with Link Loss Forwarding for remote fault management. The OSD2153P will operate at temperatures up to 75degC with 60W of PoE. Click here for more info.